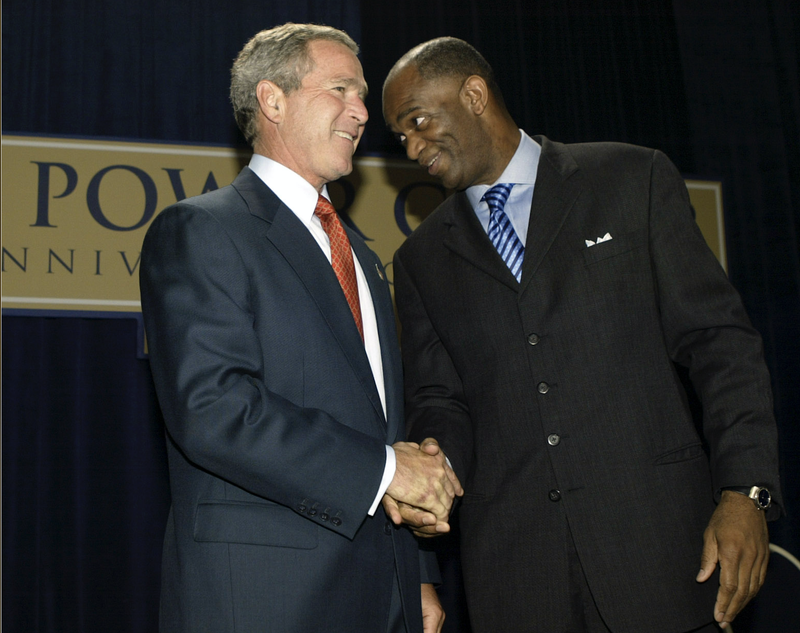 Then-President George W. Bush and Kirbyjon Caldwell shake hands at the Power Center in Southwest Houston on Sept. 12, 2003. The Rev. Kirbyjon Caldwell, senior pastor of Windsor Village United Methodist Church, a megachurch of more than 17,000 mostly African-American members, has been charged with scamming elderly investors of millions in a dubious Chinese-bond scam. CNN Money reports that the feds have charged the 64-year-old Houston pastor—and Louisiana financial planner Gregory Alan Smith, 55—with six counts of wire fraud and five counts of money laundering, as well as conspiracy to commit wire fraud and conspiracy to commit money laundering. Caldwell gained national notoriety when President George W. Bush made him his spiritual adviser. He officiated first daughter Jenna Bush’s wedding to Henry Hager in 2008. In addition to those Justice Department charges, the Securities and Exchange Commission has also filed civil charges against the two. The pair is accused of defrauding 29 mostly elderly investors by selling them Chinese bonds issued before the Communist Revolution of 1949, saying that their historical value made them “worth tens, if not hundreds, of millions of dollars,” according to charges filed. According to the SEC, “the bonds were mere collectible memorabilia with no investment value” and have been in default since 1939 because the current Chinese government refuses to recognize them. The alleged scam took place during the years of 2013 and 2014, and the two men allegedly stunted with the money, using hundreds of thousands for mortgage payments, luxury cars and other personal expenses. The SEC contends that the two made off with more than $3.4 million for bonds that were literally worth junk. Caldwell and Smith face 20 years in prison if convicted.